孙侦, 贾绍凤, 吕爱锋, 等. 2015. 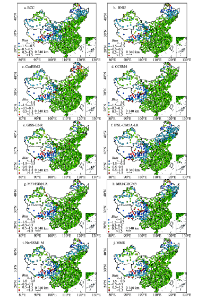 IPCC AR5全球气候模式对1996-2005年中国气温模拟精度评价[J]. 地理科学进展, 34 (10): 1229- 1240. 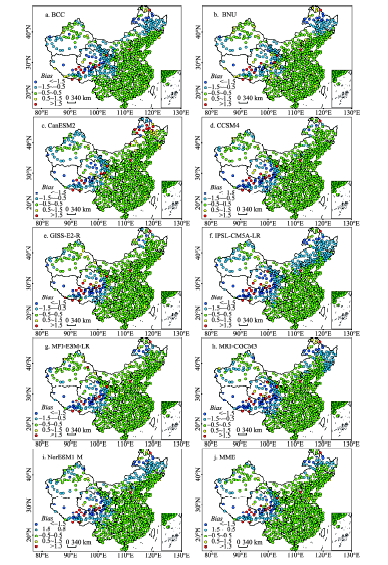 This article evaluates the precision of the temperature simulated by nine IPCC AR5 (the Fifth Assessment Report of the Intergovernmental Panel on Climate Change) GCMs (Global Climate Models) and the multi-model ensemble (MME), based on the observed temperature of 660 stations in China from 1996 to 2005. 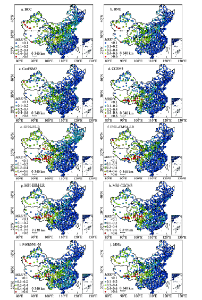 The results show that the correlation coefficients between the average daily temperature simulated by GCMs and station observations in China during 1996-2005 were very high, all above 0.86. The precision of the simulated average daily temperature in the southeast by the 10 models was higher than that in the west, judged by the lower Biases, mean relative errors (MREs), mean absolute errors (MAEs), and root mean square errors (RMSEs) in the southeast as compared to those in the west. The precision of the simulated temperature by IPSL-CM5A-LR, MRI-CGCM3, and NorESM1-M was poorer than that of the others—specially, the Biases, MREs, and RMSEs of the simulation result by IPSL-CM5A-LR , the Biases and RMSEs of the simulation result by MRI-CGCM3, and MREs and RMSEs of the simulation result by NorESM1-M, were larger. Taken into account the Biases, MREs, MAEs, and RMSEs, the simulation precision of MME was the highest. 1 巢清尘, 周波涛, 孙颖, 等. 2014. IPCC气候变化自然科学认知的发展[J]. 气候变化研究进展, 10(1): 7-13. 2 冯靖. 2012. 多全球模式对中国区域气候的模拟评估和预估[D]. 南京: 南京信息工程大学. 3 郭彦, 董文杰, 任福民, 等. 2013. CMIP5模式对中国年平均气温模拟及其与CMIP3模式的比较[J]. 气候变化研究进展, 9(3): 81-186. 4 黄传江, 乔方利, 宋亚娟, 等. 2014. CMIP5模式对南海SST的模拟和预估[J]. 海洋学报, 36(1): 38-47. 5 胡亚南, 刘颖杰. 2013. 2011-2050年RCP4.5 新情景下东北春玉米种植布局及生产评估[J].中国农业科学, 46(15): 3105-3114. 6 姜会飞. 2008. 农业气象学 [M]. 北京: 科学出版社. 7 金之庆, 方娟, 葛道阔, 等. 1994. 全球气候变化影响我国冬小麦生产之前瞻[J]. 作物学报, 20(2): 186-196. 8 李振朝, 韦志刚, 吕世华, 等. 2013. CMIP5部分气候模式气温和降水模拟结果在北半球及青藏高原的检验[J]. 高原气象, 32(4): 921-928. 9 刘敏, 江志红. 2009. 13个IPCC AR4模式对中国区域近40 a气候模拟能力的评估[J]. 南京气象学院学报, 32(2): 256-268. 10 秦大河, Stocker T, 259名作者和TSU(驻伯尔尼和北京). 2014. IPCC第五次评估报告第一工作组报告的亮点结论[J]. 气候变化研究进展, 10(1): 1-6. 11 沈永平, 王国亚. 2013. IPCC第一工作组第五次评估报告对全球气候变化认知的最新科学要点[J]. 冰川冻土, 35(5): 1068-1076. 12 王绍武, 罗勇, 赵宗慈, 等. 2013. IPCC第5次评估报告问世[J]. 气候变化研究进展. 9(6): 436-439. 13 王淑瑜, 熊喆. 2004. 5个海气耦合模式模拟东亚区域气候能力的初步分析[J]. 气候与环境研究, 9(2): 240-250. 14 许崇海, 沈新勇, 徐影. 2007. IPCC AR4模式对东亚地区气候模拟能力的分析[J]. 气候变化研究进展, 3(5): 287-292. 15 杨绚, 汤绪, 陈葆德, 等. 2014. 利用CMIP5多模式集合模拟气候变化对中国小麦产量的影响[J]. 中国农业科学, 47(15): 3009-3024. 16 姚遥, 罗勇, 黄建斌. 2012. 8个CMIP5模式对中国极端气温的模拟和预估[J]. 气候变化研究进展, 8(4): 250-256. 17 张超. 2004. 地理信息系统实习教程[M]. 北京: 高等教育出版社. 18 中国农林作物气候区划协作组. 1987. 中国农林作物气候区划[M]. 北京: 气象出版社. 20 赵宗慈, 丁一汇, 李晓东, 等. 1995. 海气耦合模式在东亚地区的可靠性评估[J]. 应用气象学报, 6(S1): 9-18. 21 赵宗慈. 1990. 全球环流模式在中国部分模拟效果评估[J]. 气象, 16(9): 13-17. 22 Challinor A J, Wheeler T, Hemming D, et al.2009. 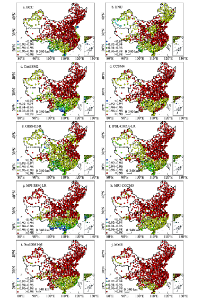 Ensemble yield simulations: crop and climate uncertainties, sensitivity to temperature and genotypic adaptation to climate change[J]. Climate Research, 38(2): 117-127. 23 Fowler H J, Blenkinsop S, Tebaldi C.2007. Linking climate change modelling to impacts studies: recent advances in downscaling techniques for hydrological modelling[J]. International Journal of Climatology, 27(12): 1547-1578. 24 IPCC. 2007. Climate change 2007: the physical science basis[R]. New York, NY: Cambridge University Press. 25 IPCC.2013. Climate Change 2013: the physical science basis [R]. Work Group ⅠContribution to the IPCC Fifth Assessment Report (AR5). Stockholm, Sweden: IPCC. 26 Jacob D J, Winner D A.2009. Effect of climate change on air quality[J]. Atmospheric Environment, 43(1): 51-63. 27 Parry M L, Rosenzweig C, Iglesias A, et al.2004. Effects of climate change on global food production under SRES emissions and socio-economic scenarios[J]. Global Environmental Change, 14(1): 53-67. 28 Verburg P H, Soepboer W, Veldkamp A, et al.2002. 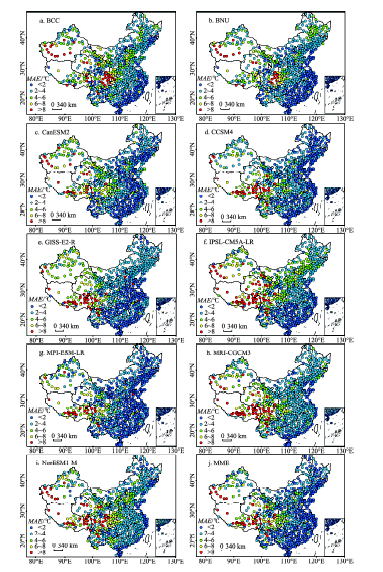 Modeling the spatial dynamics of regional land use: the CLUE-S model[J]. Environmental Management, 30(3): 391-405. 29 Zhou T J, Yu R C.2006. 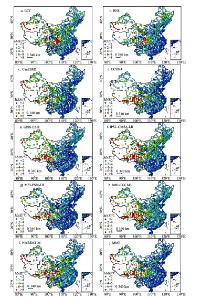 Twentieth-century surface air temperature over China and the globe simulated by coupled climate models[J]. Journal of Climate, 19(22): 5843-5858.